Scrap This, Save That: Time To Wrap The Presents! Happy Wednesday! 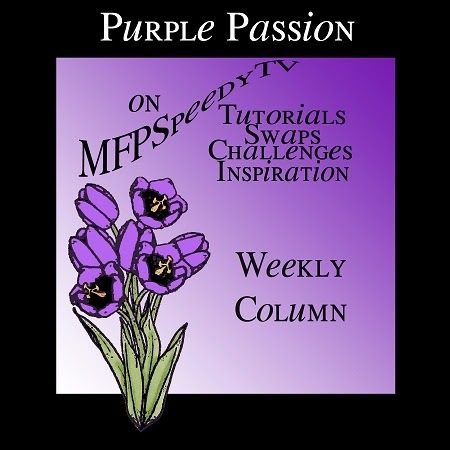 It's time for another installment of Purple Passion over at MFP Speedy TV! Oh my gosh...only one week left til Christmas! I can't believe it's come up so fast. I realize it's because Thanksgiving was a week later than usual, so there wasn't as much time in between the two holidays to get ready, but honestly, I feel like I'm still recuperating from LAST Christmas. Anyway, here we go again! As I was wrapping presents the other night, I realized I hadn't made any tags this year. I had some store bought ones left over from years past, but I made my own tags last year and I really loved the way they came out. I started working on some new ones with my Silhouette Cameo earlier today, but for some reason, the patterns I was trying to use just weren't cutting right. I got the tag shape but not all the other intricate cuts that were supposed to be on there. That's okay...Mark's Finest Papers stamps to the rescue!! I started with my favorite color cardstock...purple of course! Using a basic tag shape and some of my favorite MFP Christmas stamps, I stamped onto the paper with VersaMark ink and then embossed in silver and gold powders. The stamp sets I used were Holly Jolly Greetings, Holiday Tag, and Calendar. I finished each tag off with some cute sparkley ribbon! So...Are you ready for Christmas yet?? ?